By WPH SR Writer, Dave Fink- Lying in a hospital bed with tubes in his nose, IV’s in his arms and his chest cut open, the glory of pro handball appeared to be a lifetime away. Aortic valve heart surgery to mend a slowly closing valve from an abnormal heart beat nearly ended Mando’s handball career at just 21. Told by doctors that he may never be able to play handball again, Mando’s competitive spirit and drive ensured that he would not only play again, but that he would return to the pinnacle of the sport. Mando would not allow his unfortunate circumstances to derail his handball dreams. Starting his comeback slowly, Mando began light jogging and biking, supplemented by working construction full-time, working hard labor from nine to five. Eventually, Mando’s training would intensify, arriving to work an hour before his shift on his bike and running sprints, working eight hour shifts and biking to the handball courts to play until dark. Adding to the rigorous workout routine is a disciplined diet centered on nutrition and protein to ensure his blood will not become too thick or too thin and interfere with the aortic valve replacement. Just over a year after a potentially life-threatening heart surgery, Mando returned to the WPH Race 4 Eight Tour to defeat then number one, Allan Garner, in what Mando refers to as his best ever moment on the handball court. Mando started playing the game before he could walk, playing in his first tournament at six years old and winning numerous state and national championships along the way. Naturally ambidextrous, Mando writes and eats with his left but serves and throws with his right. The difference between his two hands on the handball court is imperceptible. Standing at just 5’5, Mando possesses the strength of a power lifter and the agility of an NFL running back. Seemingly always in a position in strike a kill shot because of the strength in his legs and his low center of gravity, Mando is the game’s most exciting player. 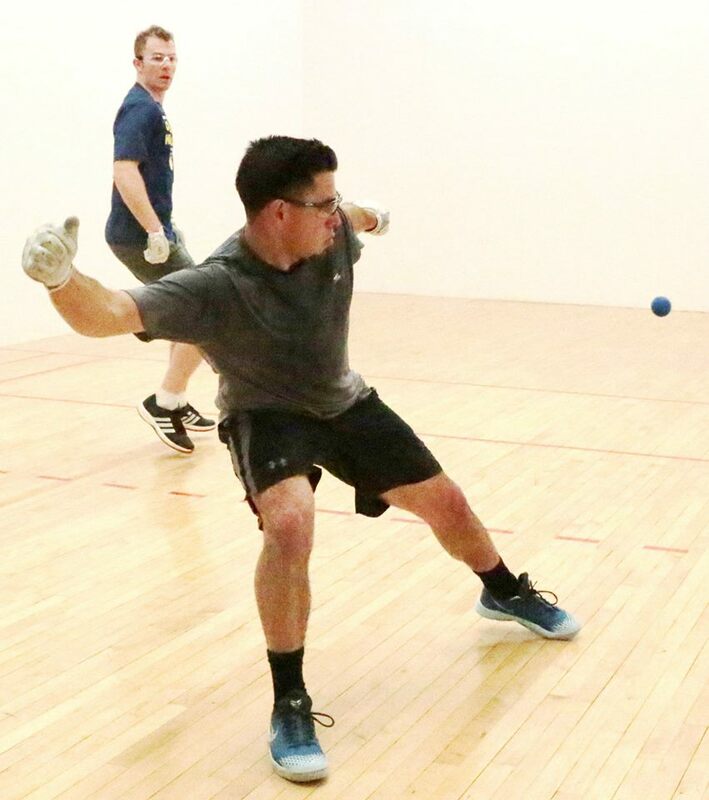 Not dissimilar to most of the top handball pros, Mando was introduced to the game by his father, Armando Ortiz, Sr., who continues to be his number one supporter, coach and confidant before and after matches. Mando has also been and continues to be influenced by Vince Munoz and Marcos Chavez; learning sportsmanship, humility and dazzling shot making in becoming one of the game’s greatest showmen, gentlemen and role models. Much like his mentor and idol Vince Munoz, Mando is reserved and modest, but if asked, Mando will tell you that he wants to be number one and stay on top for as long as possible. A first strike, fly-kill and back wall kill specialist, Mando has the ability to overwhelm any opponent. Mando cites the friendships and camaraderie in the handball community as making him the person he has become. A multiple sport star in high school, playing baseball, football, wrestling, track and field and a star halfback on the football team, Mando credits some of his mental toughness and discipline to playing team sports. This mental toughness is on display in all of his matches, particularly when he challenges the game’s elite. Matching or exceeding the skill, intensity, competitiveness and mental fortitude of any player, Mando expects to win every match he plays. Playing in his first WPH Race 4 Eight match in nearly two years in his second pro comeback, Mando found himself in the qualifier for the Plummer WPH Race 4 Eight III Stop #1 against then national finalist and white-hot Martin Mulkerrins. Displaying the power and sublime shot making that has always been his trademark, Ortiz obliterated one of the game’s best players in just 25 minutes, a foreshadowing of his greatest handball triumph. Mando advanced to the semifinals of the New York Athletic Club WPH Race 4 Eight III Stop #4 five months after his victory over Mulkerrins to face current world champion and arguably the greatest player in the game’s history, Paul Brady. Most expected Brady to send a message to his first-time adversary, but it would be Mando delivering the message. Refusing to allow Brady to gain any momentum or race to one of his trademark insurmountable leads, Mando stunned Brady with kill shots and power from everywhere on the court, never showing the slightest hint of nerves or intimidation in his first showdown with the four-time defending world champion. Tied at 19 in a frenetically paced and wildly entertaining first game, the game hung in the balance as both players served twice at 19 all. Two unlucky bounces allowed Brady to clinch game one and when Mando his sprained ankle early in game two, the match ended anti-climatically. Picking third in the unique reverse blind-draw ceremony just six weeks after their first encounter at the WPH Race 4 Eight III Player’s Championship in which the five, six, seven and eight seeds selected amongst the one, two, three and four seeds for their opening round matchup, Mando selected third. With just his junior rival Luis Moreno and Paul Brady left on the board, Mando confidently selected Paul Brady, looking straight into his eyes while making the selection. Brady’s face turned pale white and he exited the ceremony before Mando’s name was even pasted to the draw sheet. Message two delivered. Advantage Mando. Brady and Mando’s rematch at the WPH’s most lucrative and prestigious event, the Player’s Championship broadcasted live on ESPN3, would signal the legitimate arrival of the game’s next rivalry. Brady secured a one game lead in an error-filled first game that had far more to do with Mando’s near misses than his own play. Mando turned his near misses in game one into nearly flat rollouts in game two. Brady’s body language revealed the changing of momentum. Never one to reveal his emotions, Brady’s shoulders slumped, as he appeared to be genuinely baffled by Mando’s consistently spectacular play. Brady would desperately experiment by attempting shots and serves completely foreign to his game, as Mando continued to apply relentless and effective pressure. After winning game two convincingly, Mando surged to a huge tiebreaker lead and held off a late Brady charge to become just the second player to defeat Brady in tournament play in ten years. From being unsure he would ever play handball again to defeating the world’s greatest player on handball’s biggest stage, Mando’s fighting spirit and love for the game propelled him to the apex of the handball world. In a decade in which Brady has been rarely challenged or rivaled, the most improbable of all rivals emerged.